A tea that, at long last, actually tastes like oranges! Summary : A great tea for anyone in search of a tea that tastes like oranges! Review : I love Oranges. I love the color of Oranges. I love the taste of Oranges. I even love the taste of Orange in just about everything. At times, even, I think I should move to Florida and secretly at night raid the orange trees so that I could have all the fresh Oranges that I love. And becuase of this fascination with all things "Orange", I make every attempt to find a tea that, well, tastes like an Orange. I've searched far and wide, trying all sorts of teas - in particular the "Orange Spice Teas" that are available - only to have my hopes shattered on the rocks of despair. But finally, at long, I have found a tea that actually tastes like an Orange! The tea is from Adagio Teas and is called, simply enough, Rooibos Orange. As you can guess by the name, this Orange tea is a Rooibos tea. 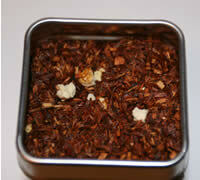 For those not familiar with Rooibos Tea, the leaves for this tea are grown in South Africa. The leaves of this tea are red - in sharp contrast to the more common green color found on most other tea leaves. Like all Adagio Teas, the Rooibos Orange that I ordered came in a lightproof, well packed tin. Upon opening the tin, I knew IMMEDIATELY that there was a strong probability of liking this tea. The reason? Simple, it smelled like an Orange! It's been my experience that if I don't like how a tea smells out of the container, I probably won't like the brewed variety either. And so it was with those happy thoughts that I brewed this tea. The tea after brewing smelled like - you guessed it - Oranges too! Another happy sign. Even better, the tea itself has a nice "reddish-orange" color about it - yet another good sign for a tea that is supposed to taste like an Orange. What makes this particular tea so tasty, at least to an orange lover like myself, is that the Rooibos tea leaves have been flavored with Oranges. And believe me - it tastes like it too! If I had any disappointment with this tea, is that it perhaps wasn't quite as "strong" as I would like it. Make no mistake, there was definitely a pretty good orange taste in this tea. However, it wasn't quite like sucking on a raw Orange or a Orange Popscile! I think next time I have this tea I'll use more than a teaspoon of leaves and let it brew for another minute or so, just to see what happens. Overall, if you love Oranges - if your dreams consist of Oranges on pretty Orange trees in Florida - drop everything you are now doing and run over to Adagio Teas and pick up this tea. You won't be disappointed! Recommendation : If you like oranges and tea, stop right now and go order this delightful tea from Adagio Teas.